Katie Jensen, BFA graduating senior majoring in painting, called the show “an eccentric exhibition” and has 12 pieces on display. The Department of Art and Design at Drake University presents the 2018 Bachelor of Fine Arts (BFA) exhibition, Points of Intersection, from May 1—20. 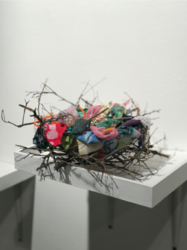 The show serves as a culmination of the five BFA graduating seniors’ work during their time at Drake, with a total of 67 works on display in media including painting, drawing, printmaking, sculpture, mixed media and design. The students, who were responsible for making the exhibition succeed collaboratively, worked to incorporate their five artistic viewpoints into a single theme. Des Moines native Olivia Hockey has 20 pieces of art in the show. “Our show has a lot of diversity among subject matter and mediums which makes it possible for almost anyone to reflect and enjoy,” said Maddie Snell, an Edwardsville, Ill., native who has seven pieces in the show. She is majoring in painting and psychology. Benjamin Gardner, associate professor and department chair of art and design, said the exhibition provides students with valuable experience in presenting their work in a professional exhibition setting. “As graduating seniors, they’ll take this experience and apply it to whatever career they end up pursuing,” Gardner said. The seniors are excited to share this experience with visitors of the exhibition because of all the time and behind-the-scenes work that goes into creating the incredible works on display. 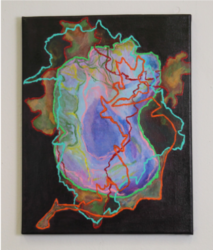 Points of Intersection opened May 1 and runs through May 20 in the Anderson Gallery. The gallery is open Tuesday–Sunday, noon to 4 p.m. and Thursday, noon to 8 p.m.
Maddie Snell has seven works in Points of Intersection, including the one above.